The picturesque town of Yorkeys Knob, dominated by its dramatic headland, is your gateway to Cairns - one of Australia's hottest vacation destinations. Cairns boasts three of Australia's great natural wonders. Just offshore, immense bastions of living coral form the Great Barrier Reef. Sixteen miles of superb beaches stretch to the north of the city - the famed Marlin Coast. Inland lays the ancient rainforest of Daintree National Park. Cairns' graceful, tree-lined esplanade was once the gateway to the gold fields of North Queensland. A travel tip - Cairns is pronounced "cans." This tiny island measures in at just 1,600 feet long by 490 feet wide, though it is the only permanently inhabited island in the Coral Sea Islands Territory. You won't find any neighborhoods, schools or homes here, however. The only structures on Willis Island comprise a weather monitoring station hosted by the Australian Bureau of Meteorology, where just a handful of weather observers reside at any given time. 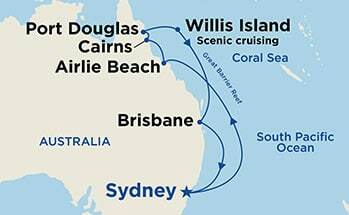 Willis Island is one of several tropical islands sitting beyond the Great Barrier Reef in the Coral Sea Islands Territory, and is surrounded by thriving reefs where many creatures make their homes. Numbering into the thousands, Willis Island itself caters to many species of seabirds, including Masked, Brown and Red-footed Boobies that cry out nearly 24 hours a day. It is also an important nesting ground for turtles. Note: Willis Island is a scenic cruising site. Ships will slowly travel past while a knowledgeable port lecturer points out significant sites you'll be able to see from onboard.